for some help, she said she had seen a demo on the old Carol Duvall Show. So between the instructions and Linda, oh wow, am I pleased. My box turned out lovely and I have some ideas for other holidays with some extra paper I have. Check out the sas project tuesday site and have some fun with their next challenge. I wish my camera and lighting skills were better because the bottom of the box is a deep purple that really complements the flowers on the patterened paper and the flowers on top I inked with the Smokey Plum ink are what make everything come together for a very lovely look. Supplies: Paper: CTMH-Promise of Spring, Heart of Winter Project Pack, Big Lots-One Pound Scrap Pack, Ink: CTMH-Z2147Smokey Plum, Bone Folder, Stampin Up-Pretties Kit. Thanks for playing with us at Project Tuesday this week! 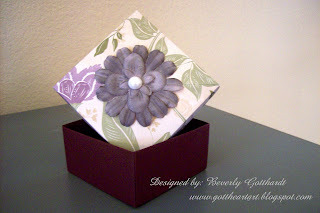 Beautiful box Beverly! LOVE the stunning flower and dp! Thanks for playing along with Stamps and Smiles - Project Tuesday!